The following article is used with permission and is courtesy of the Tenth Farm Credit District. It was published in the Winter 2007 issue of Landscapes magazine and was written by Tina Jackson. Five years ago, when Don and Karen Roets' children were beginning to leave the nest, the Texas couple turned to each other and said, "Well, what do you want to do next?" That simple question has led this energetic and hard-working pair on a journey they would never have imagined at their wedding 30 years ago. The answer came when they attended a lavender conference in Blanco, Texas, in 2002. Karen fell in love with lavender, and the idea starting a farm was born: They decided to join a small but growing number of lavender growers in the Texas Hill Country. "It was all Karen's passion, her ideas and her mission," says Don, a restaurant supply representative in the Austin-San Antonio, Texas area. Karen already had a passion for plants and working with natural materials, having worked for many years for a landscaper providing plant care at commercial enterprises, such as Whole Foods Market in Austin. 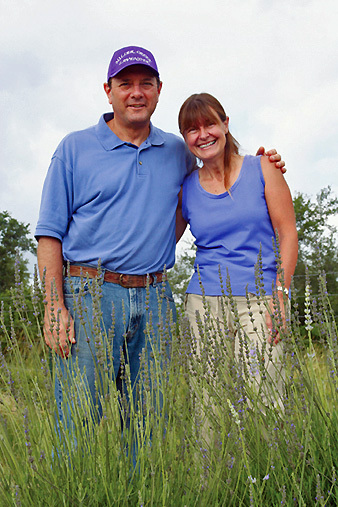 Over the next three years, the couple researched lavender farming extensively by reading and attending lavender conferences and festivals, They visited lavender farms in Central Texas, the Pacific Northwest and the California bay area, questioning farmers about growing, harvesting, distilling, cooking, and marketing lavender. While attending the Southwest Lavender Conference in 2005, The couple - with their characteristic faith and optimism - ordered 8,500 lavender plants to be delivered in October of that year. They were ready to jump into farming: now all they needed was land. In April 2005, they found the perfect property - 12.5 acres near Miller Creek just outside Johnson City, Texas. The next step was to find financing, and, as luck would have it, the solution came to them. One Saturday that spring, Don was working on a Habitat for Humanity project, and mentioned to a fellow volunteer that he needed a loan for a farm. The man said that Farm Credit could help, and directed Don to Capital Farm Credit. Don called the next week and was referred to Mark Rutledge, credit office president in Capital's Austin office. The process, says Don, went so smoothly he could hardly believe it. He was approved for the loan in two days, and it closed a week later. Says Rutledge, "We were excited to be a part of Don and Karen's dream because it promotes a new way to expand agriculture. They had really done their homework, had a solid business plan and were prepared to work really hard for their dream. Their preparation made working up their loan an easy process." In preparation for the lavender shipment to the newly named Miller Creek Lavender Farm in October 2005, the couple needed help to plow 3.5 acres for planting. As is typical in their community of niche farming operations - including successful vineyards and a butterfly farm - neighbors and friends were quick to help out. One neighbor used his huge tractor to break up the hard, caliche-clay soil. Another operated a smaller tractor to mound the rows, mixing in a rich blend of organic compost and seaweed. In the meantime, Karen and Don were busy chipping wood, hauling rocks and even chasing armadillos off the property. Just one week before the lavender shipment was to arrive, the land was ready for planting. With a little help from friends, Don and Karen planted 7,000 lavender plants by hand over a period of three weekends. "We actually ran out of space and couldn't plant the entire shipment of 8,500," laughs Don, but luckily the supplier was willing to take the additional 1,500 plants back. They planted 2 acres with provence, a type of lavender most commonly used for cooking, 3/4 acre with grosso, best for crafts because they don't drop their buds as easily and are better for producing oil; and 3/4 acre with a mixture of alba (white lavender), sweet, Spanish and angustifolia, an early-blooming and hardy variety for picking. Unfortunately, the area was under drought at the time of planting, and the couple had no watering system. But with water from a generous neighbor's well, they hand-watered all 3.5 acres of lavender using buckets - no small task, by any means. Although a few of the immature plants succumbed to the drought, most of the crop survived. Now, the couple hires local help to water the fields with sprayers. And, by fall of , the lavender, which generally takes three years to mature, will be ready to harvest. Karen works most every day on the farm, and Don joins her on weekends. "It's his retreat." says Karen, whose vision for the property keeps growing, she wants the farm to be a relaxing haven for visitors as well. "She's going to wear me out one of these days," says Don as Karen leads visitors along a little path through the butterfly garden she has created. Passing by charming wooded areas in which inviting picnic tables are tucked away, Karen points to a lavender variety bed that holds 45 varieties with delightful names such as Miss Katherine, Thumbelina Leigh and Edelweiss. A raspberry/blackberry "U-Pick" patch is also in place, and by next year the plants will be mature enough for visitors to enjoy. A small, unpretentious building serves as the farm's gift shop, where the couple sells an array of products made from lavender that they purchase in bulk from a supplier. Karen and Don developed recipes and worked with a local processor to prepare and package their products, which range from lavender pillow spray to lavender margarita mix to peach lavender salsa. Today, the lavender is thriving and permeates the air of Miller Creek farm, creating the serenity Karen dreamed of. The couple delights in receiving visitors and taking them to the lavender field to pick their own blooms. And, in anticipation of their first harvest, they are purchasing a still so that they can produce lavender oil from the fruit of their labor. What else is in store for this enterprising pair? With a characteristic creative gleam in her eye, Karen speaks of plans to put a gazebo in the lavender field, where couples can wed overlooking a "sea of purple." She also is planning a biblical garden - composed of plants mentioned in the bible - in a grove behind the gazebo where the wedding guests will be seated. Says Karen, "In that atmosphere, the experience should be even more spiritual and uplifting for guests and couples alike." What's more, she plans another field - of olives, capers and grapes. Already an enchanting place, Miller Creek Lavender Farm promises to be a truly unique and soothing experience for tourists and locals alike. The history of lavender is almost as old as the history of man. The herb has been in documented use for over 2,500 years. Lavender is often mentioned in the bible, not by the name lavender but by an earlier name for the herb, spikenard. Early Egyptians wrapped their dead in lavender-dipped shrouds. The Ancient Greeks used lavender to fight insomnia, insanity and aching backs. Romans used lavender for cooking, scenting the air and bathing in public baths, which is where it gets its name: from the Latin word Lavare: meaning to wash. In Medieval and Renaissance Europe, the washing women were known as "lavenders"; they used lavender to scent drawers and dried the laundry on lavender bushes. The Victorians used lavender for gardens and were the first to bring the plant inside. They made furniture polish (lavender wax) and washed floors and linens with lavender water. They also used lavender to repel moths. 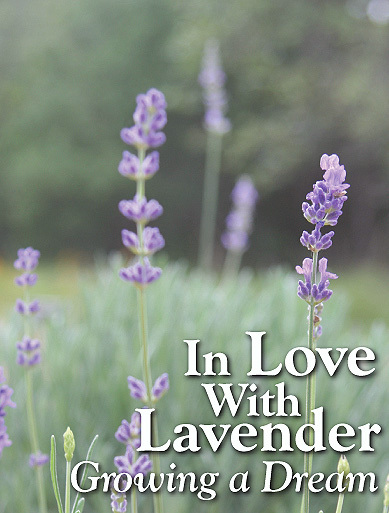 During this era, lavender started showing up in crafts such as lavender wands and sachets. During World War I lavender moved to the front lines and was used as an antiseptic. It was discovered to be good for skin wounds and burns; it helps bug bites and helps the skin heal more quickly. Today, lavender oil is used most commonly to treat: burns (from minor to scalding), eczema, grazes, cuts, inflammation, dermatitis, headaches, migraines, fainting, nausea, insomnia, bacterial infections, boils, acne, arthritis and rheumatism.